There is just something about a good burger that screams summer to me. Up until about a year ago I was purely a beef burger kind of gal, but chicken and turkey burgers have made their way into my home and into my heart, and there’s no turning back my friends! 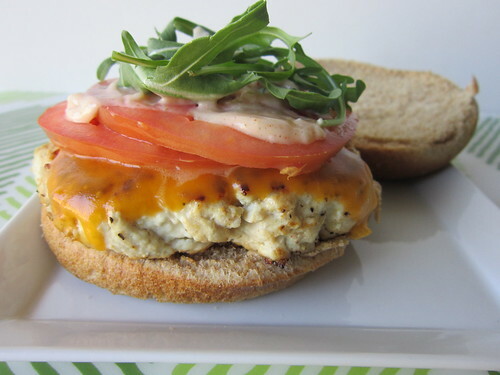 This particular turkey burger has some amazing flavors in it!! I have really grown to love pretty much anything with cumin added to it, and the smoky paprika does wonders in the aioli. The patty was moist and delicious, and the arugula added just a bite of spice. You can make this burger in a skillet during the winter, or move it outside to the grill in the warmer temps. Either way, you’ll have a great-tasting burger that will have you going back for seconds. Combine mayo, 2 tablespoons extra-virgin olive oil, fresh lemon juice, smoked paprika, garlic, cumin and coriander in small bowl. Season with salt and pepper, to taste. Place turkey in medium bowl. Add 2 tablespoons aioli and mix gently. Divide the turkey mixture into 4 equal portions, then form into patties, about 3/4 inch thick. Heat a skillet over medium-high heat and season the patties with salt and pepper. Spray the skillet with cooking spray and cook the turkey burgers 3-4 minutes per side, or until cooked through. Top each burger with 1 cheese slice and cook an additional minute, until the cheese has melted. Toast your burger buns, if you prefer, then place one patty on each bottom bun, top with 2 tomato slices, a tablespoon or so of aioli, a big pinch of arugula, and the top bun. Serve with your choice of side and a pickle spear! !